In a small sauce pan, bring balsamic vinegar to a simmer over medium high heat, simmer until the vinegar is reduced to 1/4 c. Set aside to cool. Preheat oven to 375 degrees f.
Slice the top 1/2-inch off of each tomato (reserve tops) and using a sharp spoon or a melon baller (I used an inexpensive aluminum tablespoon-sized measuring spoon) scoop out the cores and seeds from the tomatoes into a fine mesh strainer set over a bowl to catch the juices. Using your hands, break up and squeeze the pulp from the tomatoes to extract as much liquid as possible. Reserve 2/3 c. of the tomato juice (if needed add enough water to the juices to equal the 2/3 c.). In a small bowl combine the sugar and 1 1/2 t. kosher salt and sprinkle evenly inside the tomatoes. Lay the tomatoes cut-side down on a plate and set aside for 30 minutes. Heat 2 T. olive oil in a medium saucepan over medium heat until the oil is shimmering. Add the couscous and cook, stirring constantly until the couscous is coated in the oil and beginning to brown, about 2-3 minutes. Add the garlic and pepper flakes, stir until evenly dispersed and fragrant. Add the reserved tomato juice and remove from the heat, cover and let sit until the couscous is rehydrated, about 7 minutes. Gently fluff with a fork, stir in the lemon juice, basil and 3/4 c. Parmesan. Season with salt & pepper to taste. Then fold in the diced mozzarella. After the tomatoes have sat for 30 minutes, blot the insides of the tomatoes dry with paper towels. Sprinkle the cavities lightly with salt & pepper. Fill the tomatoes with the stuffing. Drizzle the remaining 2 T. olive oil in a 13x9-inch baking dish. Add the tomatoes to the baking dish. Combine the 1/2 c. shredded mozzarella and the remaining 2 T. Parmesan, sprinkle over the tops of the tomatoes. Season the reserved tomato tops with salt & pepper and place in the empty spaces in the baking dish. Bake until the tomatoes are softened but still hold their shape and the cheese on top is spotty-brown, 20-25 minutes. 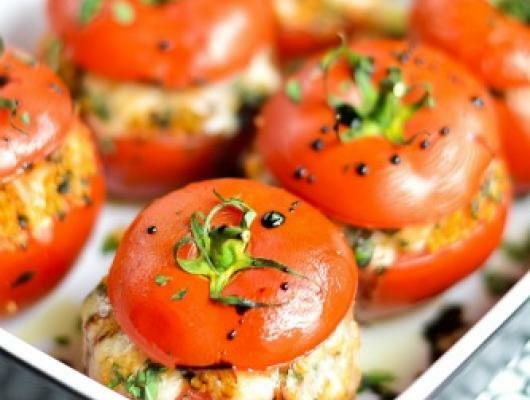 Serve the tomatoes, drizzled with the balsamic reduction. 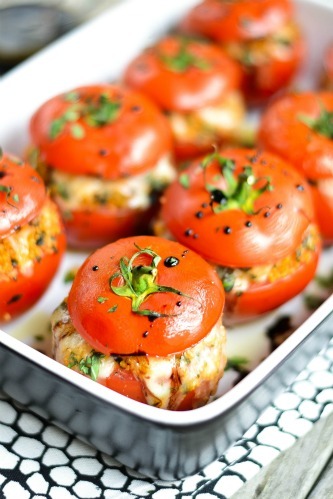 Tomatoes stuffed with garlicky couscous, plenty of Parmesan and mozzarella cheeses and tons of fresh chopped basil.